aren’t they beautiful? there are 24 here, plus a few more black ones. i let josh have one of those to take to work. i know, so generous of me. thank you sam’s club for carrying them. thank you josh for buying them. thank you wordpress for letting me blog about them. 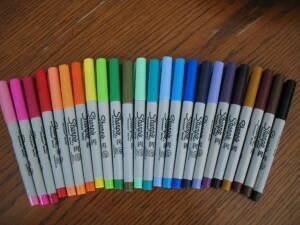 i’m in sharpie heaven. Ahh – this would make me SO happy too! They are beautiful and you are hilarious! I should send you a picture of my 120 count prisma color pencils! I love looking at them!!! hahaha.